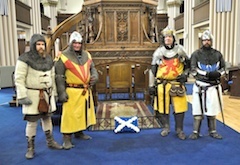 Reenactors visited the Abbey this week, on the occasion of the 700th Anniversary of the Battle of Bannockburn to say a prayer and lay a wreath on the tomb of Robert the Bruce, situated under the pulpit in Dunfermline Abbey. Thanks to Derek Welsh for the great photos. Read more"The Bruce Visits the Abbey"
The children from Touch Primary Choir joined us as part of the Celebration of the Young Church service on Sunday. They sang beautifully during the offering and at the end of the service and were much appreciated by all there. The Abbey Youth Group hosted senior members of the congregation this afternoon at the annual AYG Social. The talented youth group provided the entertainment with singing, guitar playing, and a cello solo. Read more"Abbey Youth Group Social"
Read more"Robert the Bruce Book Launch"
Morning Worship takes place every Sunday at 9.30 and 11am with Coffee and Tea served between the services in the Church Halls. 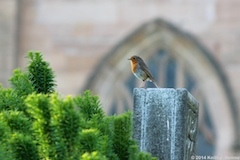 Midweek Prayers are held at Noon each Wednesday in the Memorial Chapel during the Summer months. Mountain Tops and Valleys by Rev MaryAnn R. Rennie on March 3, 2019. Reconciling by Rev MaryAnn R. Rennie on February 24, 2019. Sermon - 17th Feb 2019 by Rev Dr Rosie Magee on February 17, 2019. 4th Sunday after Epiphany by Rev Dr Rosie Magee on February 3, 2019. Epiphany by Rev Colin McIntosh on January 27, 2019. The Empty Glass by Rev MaryAnn R. Rennie on January 20, 2019. 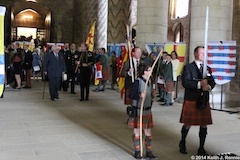 The Abbey Church of Dunfermline is now open to visitors again. Entry to the Abbey Church is always free but we do appreciate any donations towards the upkeep of our amazing building! You can see our newly expanded range of gifts in our shop, and of course there is Robert the Bruce’s tomb, the Bruce exhibition and the fantastic stained glass windows amongst other things. You will be given a warm welcome from our custodians who will be happy to take you on a tour and tell you all about the church and the rich history.